The ideal mixture of comfort and excercise. Why bother to pack your luggage every night, jump on your bike. By the time you cycled to the day’s destination, the barge has arrived and awaits you with a strengthening dinner. You can use one of our bicycles, or bring your own bike. On board of our barge you will find a selection of great biking routes. Combine barging with bicycle activity for a really unforgettable vacation! We offer special routes to please the active bikers. 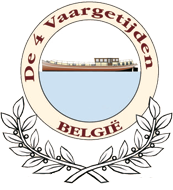 Unpacking is required only once; the barge “De 4 Vaargetijden” will join you at the next stop every day and offer you all facilities! We have selected the most beautiful bicycle routes for you. Regular distances go from 38 to 69 km per day, although most routes offer alternatives. It is always possible to join the barge in the morning, then go biking in the afternoon or complete the whole journey. For groups of at least 6 people these routes can be organized all year round! (8 days / 7 nights) Difficulty: mostly flatlands & with clear road signs Starting from Oudenaarde, this tour will take you from the “Flemish Ardennes” through the Schelde and Lys region towards Bruges and its surroundings. Whilst the barge makes its way on the rivers, such as Lys and Yser, with their narrow locks and bridges, the biking tour offers an ever-changing landscape, with rural statehouses and castles. The cultural impressions of Oudenaarde and Bruges will blend with the picturesque region of the “old” Lys river, the artists’ village St.Martens Latem and also with the “Westhoek” region. (8 days / 7 nights) Difficulty: rather hilly & without road signs This is the perfect tour for those who like to combine a physical challenge in an area with a rich cultural heritage, spiced with plenty of local delights. You will see idyllic villages, also cities such as Mons and Tournai, the oldest city of Belgium, and off course the engineering of the ships locks and elevators. Biking will require slightly more expertise, as routes are not locally indicated, requiring some map reading skills! The hilly landscape demands physical effort, but luckily the local beer gardens will supply the necessary refreshments! (8 days / 7 nights) Difficulty: mostly flatlands & with clear road signs This tour covers all aspects of the eastern Flanders province, where you can discover regions with romantic names like the Flemish Ardennes, Zwalm or Meetjes region. Ghent and the Lys surroundings, Bruges and its environment may need no introduction. With a changing landscape and an easily adaptable program, this tour is as enjoyable for bicycle enthusiasts as it is for a family with children. Every day the bicycle tracks can be extended or reduced. (8 days / 7 nights) Difficulty: level and slope & with clear road signs From Maasmechelen this tour offers a view over Limburg, on the border with the Netherlands, clearly characterized by the Meuse River where nature is evident; woods, heath lands, dunes and brooks. Small towns provide another aspect to see in this area: abandoned coalmining infrastructure or breweries, with plenty of tasting opportunities in a local bar. Bicycle tracks are based on a local network of well marked bicycle routes, meaning you can always take a shortcut or add on a loop! It makes this area ideal for bicycle activities with children.